Few things in life rival the bonhomie of sharing a picnic with friends and family. add a shady spot on a hot summer’s day, delectable treats, and a glass filled with the best the vineyards can offer and you’ve certainly got the ingredients of ‘le good life’. Enjoy a delicious and relaxing country-style picnic under majestic oaks in beautifully landscaped gardens amidst Franschhoek vineyards at Grande Provence Heritage Wine Estate during the months of September through to April inclusive. Prepared by Executive Chef Guy Bennett, the Grande Country Picnic basket is filled to the brim with Dalewood camembert and preserves, charcuterie cold cuts, grilled free range chicken, smoked snoek pate, estate-made hummus, freshly baked bread, salted butter & olives, a crisp heirloom garden salad, and decadent Rocky Road Valrohna bar. These are all perfectly rounded off with a bottle of Grande Provence wine. Cost: R 650.00 sharing basket for 2 people. R 325.00 single basket. *Picnic baskets are available only by booking 24 hours in advance, and as we only have a limited number available daily, please book early to avoid disappointment. Weather permitting and vegetarian menu available, on request. Full pre-payment is required to confirm the booking. For reservations please email, events@grandeprovence.co.za. Under the trees of the Pavilion lawn is where you’ll find this picnic spot, next to the main werf. It’s a more relaxed affair with the focus on lazing about and enjoying the wholesome farm produce and Boschendal wines on offer. Guests are welcome to bring their own blankets, chairs and tables and enjoy a leisurely afternoon under the trees with family and friends. Bean bags are available for rent on the day. Kids can enjoy playing on the jungle gym and the extensive lawns. In the basket, you’ll find wholesome farm produce and artisanal goodies courtesy of Boschendal’s bakers, butchers and chefs. Expect fresh bread, a seasonal salad from our food garden, free-range whole rotisserie chicken, homemade preserves and homemade ice cream. For groups more than 20 people kindly contact reservations@boschendal.co.za or +27 021 870 4274 to make a booking. October 2018 – April 2019: Wednesday to Sunday. Live music performances on Saturdays between 13:00 and 15:00. May 2019: Only open Saturday and Sundays. Please note we are open on 24 & 25 December 2018 and 1 January 2019. Basket collection from 12:00 – 14:00. Please note that your basket will only be ready for collection at your booking time. R460 basket for two, R245 vegetarian basket for one and R105 for children between 3 – 10 years. 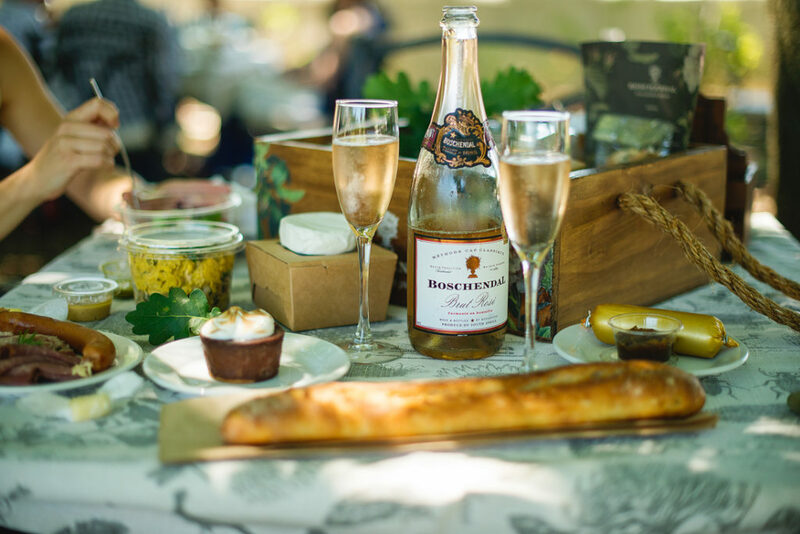 Our classic Boschendal picnic is located at the Rhone lawns – this is in the wine-making and wine-tasting hub of Boschendal. The picnic area has spectacular mountain views and is surrounded by the exhibition vineyards, the Rhone Homestead, the Cellar Door and our Winery. Picnic baskets can be enjoyed at carefully-laid out tables or on a picnic blanket under the shade of the oak trees. This is a full-service area. Rhone Rose Garden picnic baskets include food made from our natural farm produce including delicate pates, freshly baked bread, salads from our Werf Food Garden, coronation chicken, a selection of cold meats, homemade preserves and one of our celebrated desserts. October 2018 – April 2019: Open 7 days a week. R520 basket for two, R275 basket for one and R105 for children between 3 – 10 years. You are welcome to explore the grounds at Mont Rochelle, and what better way to this than with a picnic basket prepared by our team?! Just let us know whether you’d prefer a bottle of white, red, or perhaps both! 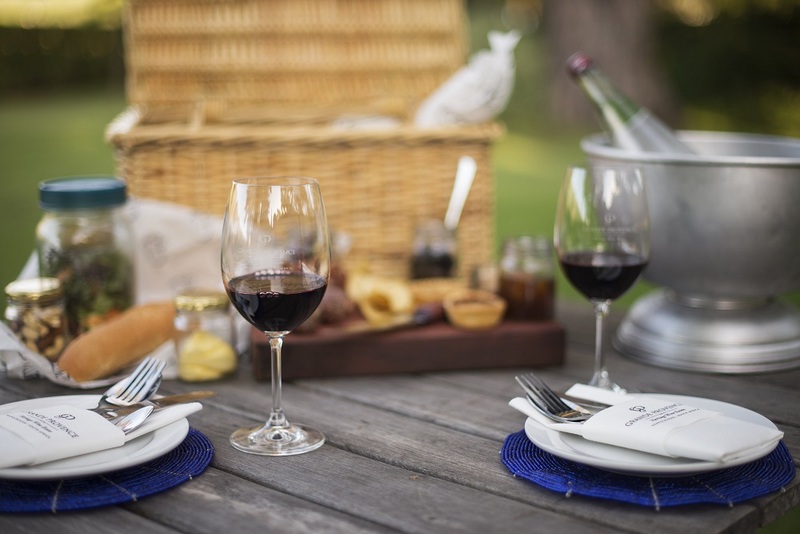 Our picnic baskets are perfectly designed to cater for 2 adults starting from R400 to R520 per basket, Mont Rochelle Mini Baskets are also available at R100 per child 12 years and under (all baskets excludes wine and beverages). Pick up your picnic basket at the Country Kitchen from 11am and take a stroll with your blanket in hand, through the vineyards down to the dam, into the rose garden or to the shade of an oak or weeping willow and make yourself comfortable. 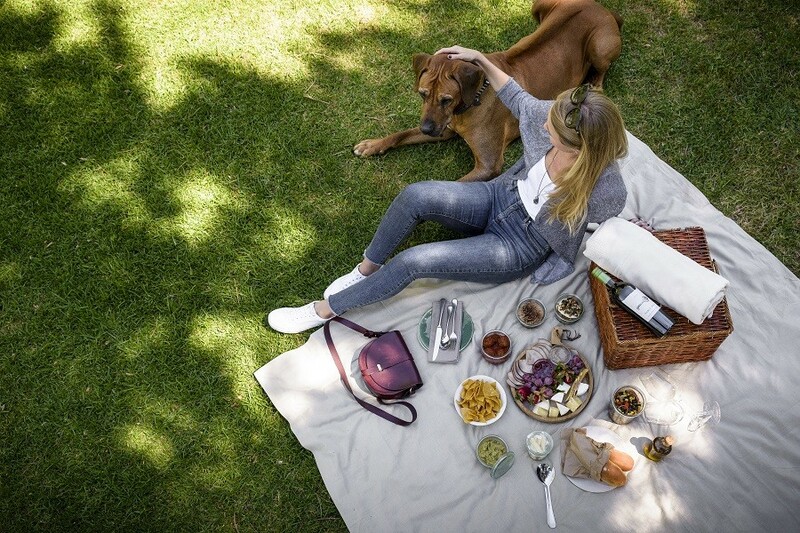 There is nothing like a summer picnic in the Cape Winelands. Shaded by an historic oak tree, big luscious lawns and freshly prepared Herb Inspired Picnic Baskets and a bottle of Allée Bleue Wine, what better way to spend the day out with your family and friends. Download our Standard picnic basket menu and vegetarian picnic options. For a booking or enquiries please contact us at info@alleebleue.com or call us 021 874 1021. Enjoy a latin-inspired picnic on the lawn at Noble Hill. Relax at the water’s edge or under the shade of willow trees, take in the views of the Simonsberg and surrounding vineyards, and munch on delicious treats prepared by our kitchen. 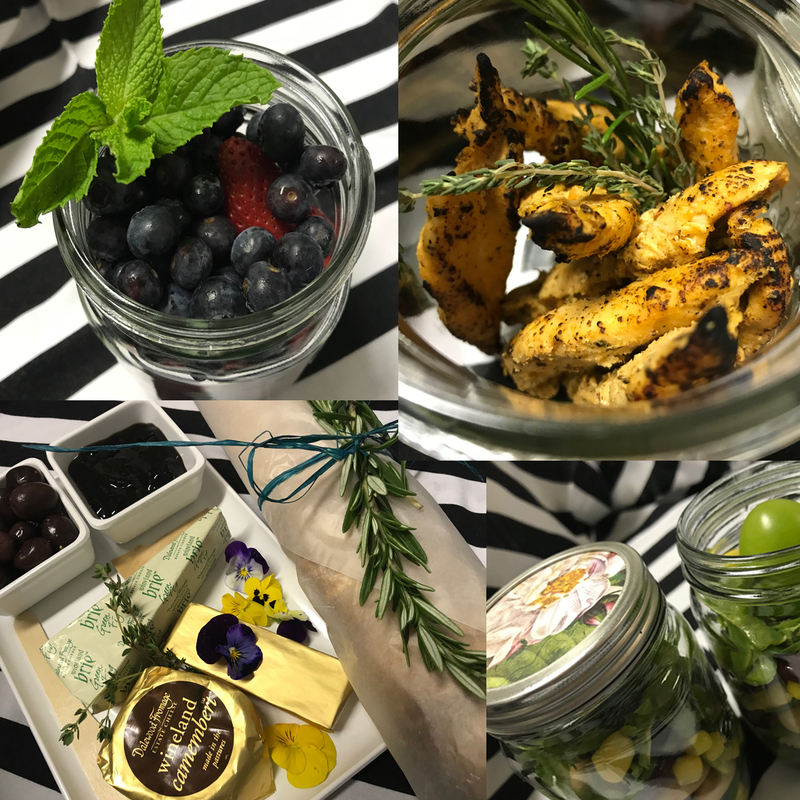 Each picnic baskets includes a bottle of Noble Hill estate wine, charcuterie & local cheeses, fresh avocado guacamole, albondigas, a black bean & grilled corn salad, homemade mushroom pâté, bolillo rolls and homemade tortilla chips, mineral water. End your picnic with a delectable duo of cappuccino cake and carrot cake. A vegetarian option is available for each basket: charcuterie & albondigas will be replaced with grilled portobello mushrooms and peppadews. Various gourmet additions are available. Please refer to our menu for these and specify them when making your booking. Kid’s picnic baskets can be ordered from your server upon arrival. An individual basket with a choice of quesadilla, wors roll, or pb&j. Yogurt, chips, juice, & bubbles. R 540 serves two, R 960 serves 4. Advance booking is required. Changes & cancellations require 48 hours’ notice. Picnics are available October-April. Baskets for three people, baskets for one person, substitutions, and alterations are unfortunately not available. Arriving at our Franschhoek Kitchen, your picnic baskets will be ready for collection filled with freshly made delicious produce, with a selection of our award winning wines available to purchase. From here a short saunter through the vineyards brings you to the the trees overhanging the river where all you hear are the birds singing and the laughter of your friends as dappled sunlight melts the day into enchanting flavours and beautiful memories. Baskets are available for collection from 12h00 till 15h00. Picnic area closes at 16h30. Picnics available from Monday to Sunday. Your basket includes all cutlery and crockery, blanket and pillows. (Please be advised that no vehicles are allowed at the Picnic area, although arrangements can be made for disable access). 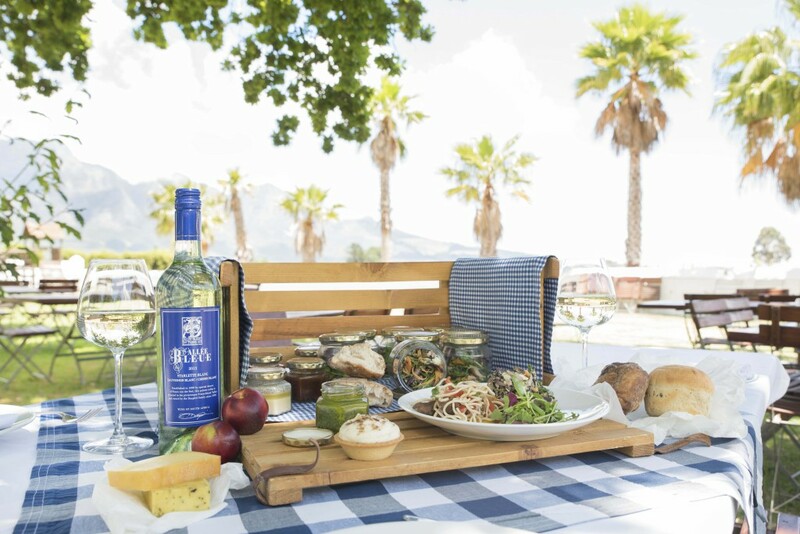 Our picnics can be enjoyed in a tranquil setting – next to the old Manor house pond, surrounded by our vineyards and the majestic Franschhoek Mountains. Kiddies picnic boxes are also available at R160 per child. Picnic baskets are only available on request and 48 hours’ notice is required. Bookings will only be confirmed once we received proof of payment. Please note that picnics are weather permitting. Our picnic season runs between the months of October and March. For bookings and enquiries please e-mail pr@labri.co.za. We look forward to hosting you at La Bri. 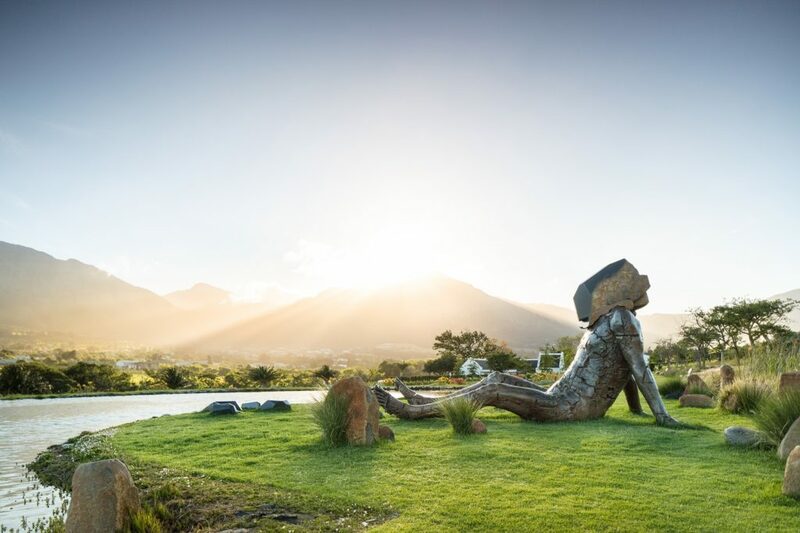 A relaxing and rewarding way to spend a few hours is a visit to Leeu Estates, a five-star getaway ensconced in 68 hectares (168 acres) of landscaped gardens, manicured vineyards and indigenous fynbos in the Franschhoek valley, and to take a guided tour of the gardens interspersed with artworks. The tours provide an opportunity to connect with art and nature in serene and meditative spaces with exceptional views. Enjoy a picnic in the vineyards or Bokkie Garden. Tour can be booked for 12:00 or 13:00. More information here. Download our picnic menu here. Bookings can be made for group sizes from two to 10 guests by emailing bianca.aucamp@leeucollection.com.